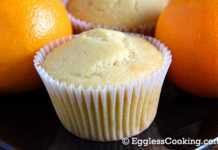 This page specifically describes how to use vinegar as an egg substitute in baking. Check out other possible egg substitute ingredients, quantity, and best suitable baking recipes here. First I would like to thank all my blogging buddies for flooding my inbox with recipes using EnerG egg replacer powder. You all know that my husband only does the round up right! I have to give him the content and he will take care of the presentation part. Since he is extremely busy with his office work, he can work on this only on Sunday. So wait until Monday to see what wonders you can create with egg replacer powder. This month’s egg substitute is vinegar. I read in a couple of books that 1 tablespoon of vinegar along with 1 teaspoon of baking soda can be substituted for 1 egg. 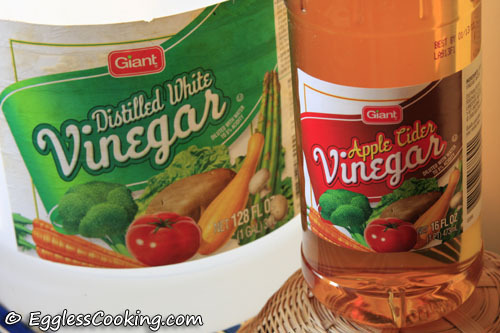 Both white distilled vinegar and apple cider vinegar can be used. This combination works best in cakes, cupcakes and quick breads. I also read in few forums that 2 tablespoons of lemon juice can be used in place of the 1 tablespoon vinegar. So for this event you could use either, but I have to mention here that I have not tried the lemon juice substitution. Also I see a lot of baking recipes with vinegar, especially in various vegan books, websites and forums. You can try those recipes also. That is, you could either take a recipe which has eggs and substitute it with vinegar or try recipes which already has vinegar in it and is eggless too. I used applesauce for brownie mix once (giardelli mix if I remember correctly)and they came out pretty good, just had to bake a little bit longer. I used flax eggs and vegan butter last time (I don’t remember the brand of mix) and they came out oily, dence and almost too chewy (quite chocolatey though )…I think brownie mixes vary and what works for one may not work for another. What about using collagen powder derived from beef gelatin? I do not use gelatin being a vegetarian. I did cupcakes and they turned out better than any other ingredient I’ve used in place of eggs. I seem to think the chocolate taste better than vanilla though. 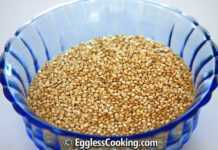 Can I use white distilled malt vinegar for egg substitute in baking, please? I guess so. I have used white vinegar. I use vinegar and baking soda for “depression era cakes”, and they are fabulous; I use dairy ingredients, but the non-dairy versions are great, too. There are lots of recipes online for depression cakes; some call them “crazy” or “wacky” cakes. My quest now is egg-free brownies. Flaxseed doesn’t work. 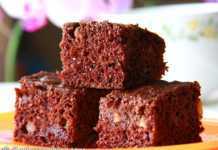 I have a recipe that uses melted chocolate chips and applesauce; it’s decent, but I want to replace the eggs in my cocoa brownie recipe. I’m wondering if baking soda abs vinegar can do the trick. I’ve had too many fails to want to risk it. I am on the same quest! Right now, vinegar and baking soda are the only things I have to experiment with, so I will try it and let you know what happens! HI. I WOULD LIKE TO KNOW WHAT EGG SUBSTITUTE CAN I USE TO MAKE THE FILLING OF A MILK TART WHICH USES 2 AND A HALF CUP MILK AND 2 EGGS. Probably silken tofu. But not sure because I haven’t tried it before. What a joke, how could vinegar be an egg substitute. Where are the needed proteins, where are the good needed cholesterols. If this is what you call healthy, maybe you should look somewhere else for your health needs. The only substitute I could find for a store bought egg is a free range egg that does not have access to any GMO grains. Jeff I guess you are unaware that this website is dedicated for egg free baking/cooking to help people who cannot bake with eggs or cook with eggs. I guess you are also unaware of the fact that there are a lot of children and adults who have egg allergies and eating eggs in any form can be a disaster. I guess you are also unaware of the fact that there are some vegetarians who do not eat eggs not just meat. I guess you are also unaware of the fact that some people in the world do not consume eggs for religious reasons as well. So this is the purpose of this website, to provide egg free recipes for people who cannot eat eggs whatsoever. Such people Google for egg substitutes in baking, egg free cakes, eggless cookies etc and land here. Vinegar, silken tofu, applesauce, mashed bananas, Ener-G egg replacer powder, flax seed meal, etc helps to bake without the use of eggs but gives the same results. Hope it’s all clear now. Not instead of baking soda but along with baking soda, vinegar makes a very good egg substitute. But should not be used to substitute more than one egg. I bought a box cake mix that required the usage of three eggs, but the cupcakes were for my vegan niece’s birthday party, so I made the substitutions. I made the cupcakes with the appropriate ratios of vinegar and baking soda and they turned out looking (LOOKING) perfectly fine. I brought the cupcakes to the party and the kids were eager to take a bite. But, as their teeth sank into the fluffy flesh of the cupcake, their faces contorted into a grotesque expression that could only be recreated by biting into these hellcakes. Kids were puking up like fire hydrants. Parents were crying. No one could settle the chaos that my cupcakes had caused. I took a bite in attempt to defend my cupcakes, but ohhhhh man. . .
Needless to say, I am no longer the favorite aunt. I have mentioned in the egg substitutes page that vinegar works only when you have to replace just 1 egg. For recipes like this where you have to use 3 eggs it’s a good idea to use yogurt, silken tofu or a combination of both. I have not broken it down like that so far Sunita. I usually take a recipe and do changes. Just reading the comments where people are saying the taste of the vinegar puts them off. I use apple cider vinegar as it has a slightly sweeter taste (and milder) and gets lost in the flavours of the recipe. It does the same job as regular white vinegar. My sister and I have both used the baking soda + apple cider vinegar method to great success, a recent batch of muffins came out very fluffy and nice. Exactly..I use only apple cider vinegar in my baking recipes. If I were to remove the eggs and sub it with 2 tbsps vinegar, does that mean I would add 2 tsps baking soda, too? Even factoring the yogurt in? I think so. I have not tried using vinegar for 2 eggs. I wouldn’t suggest substituting vinegar for 2 eggs. I’m guessing the taste and texture might not be favorable.